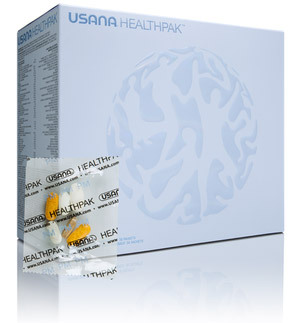 The HealthPak supplement by USANA is ranked #4 in our comparison of over 100 popular multivitamin brands. HealthPak comes in the form of AM and PM packets, which contain 6 tablets each that need to be taken with a meal (preferably your breakfast and dinner). Wide distribution: The HealthPak supplements are distributed by USANA network marketing affiliates in North America and 16 other countries. Synthethic ingredients: Contains some synthetic vitamins, such as Vitamin B6 (from pyridoxine hydrochloride), Vitamin C (from ascorbic acid), Folic Acid, and Vitamin B12 (from cyanocobalamin). High price: Due to its network marketing distribution model HealthPak comes at a premium price. The HealthPak multivitamin by USANA is an excellent multivitamin. Consumers can rest assured that USANA provides effective supplements that bring tangible health benefits to people who use them. How does USANA HealthPak compare with other multivitamin brands? MultivitaminGuide.org offers comparison between the USANA HealthPak multivitamins and of all major vitamin supplements available on the market. Some of the unique aspects of this guide include comparison of the USANA HealthPak multivitamin with 100 other vitamin supplement products, including popular brands such as One-A-Day, GNC, Equate, Kirkland, Shaklee, Nature Made, NOW Foods, Melaleuca, Puritan’s Pride, Herbalife, TwinLab, and Walgreens. The table below provides a summary of the Effectiveness Scores of some of the more popular vitamin supplement brands available on the market, including the USANA HealthPak multivitamins.